Join an epic journey across Peru’s Inca Trail. The Inca Trail to Machu Picchu is one the world’s most rewarding, ancient and famous journeys. In its pre-Columbian heyday, the Incan road network was the most advanced transportation system in South America. Spanning more than 25,000 miles, the Inca Trail included dozens of interconnected roads, snaking and branching across the mountains, deserts and shorelines of modern-day Chile, Argentina, Bolivia, Peru, Ecuador and Colombia, where its remnants can be found to this day. Since being rediscovered in the 1800s, the Inca Trail has become a beacon for adventurers, shutterbugs, archaeologists and dreamers. Unfortunately, the renewed interest has left much of the trail in disrepair: especially the 52-kilometer (32-mile) segment between Piscacucho and Machu Picchu. To protect their national treasure, the Peruvian government passed a series of laws in 2001 limiting access to 500 people per day and forbidding tourists from hiking alone. Guided groups were limited to 40 people, and each organized tour group was required to carry a standardized set of equipment, including sleeping bags, tents, water, first aid, oxygen and emergency radios. Meanwhile, the maximum weight any porter could carry was strictly limited to 25 kilograms (55 pounds). These changes resulted in organized tours that include more support staff than trekkers, dropping the number of possible hikers to 200 per day. That’s why you had to book your trek online nearly a year ago. After leaving Piscacucho, this is the very first hill you climb on the Inca Trail. After months of anticipation, preparation and excitement, you are finally in Cuzco, Peru, acclimated to the high altitude and ready to go. As you turn off your alarm and look at the time, moonlight illuminates the numbers: 4:30. Excitement acts as a natural cup of coffee, and you jump out of bed, finish packing your backpack, put on a new pair of hiking shoes, fill up your water bottle and head to the hotel lobby to meet the bus. It’s a full morning of bumpy transportation, naps and breakfast before you reach the town of Piscacucho and the start of the Inca Trail. Since you hired a chuskie (the Quechua word for porter) to help carry your gear, you happily hand him 10 pounds of stuff that you won’t see again until nightfall. Anything you might need before then — camera, jacket, snacks, water, sunscreen, toilet paper — must be carried on your own back. Finally, after your passport is stamped at a guard house, it’s the moment you’ve been waiting for … You’re on the Inca Trail! You are surrounded by nature throughout the 4 day Inca Trail trek. These amazing people will be your family for the next four days. Much like traveling in an ancient caravan, your intrepid group includes a mix of adventurers, guides, chuskies … and a chef. In total, 40 people set off on the journey that begins alongPeru’s Urubamba River. The initial ascent is moderate, passing through desert-like terrain and into lush-green mountains. As you climb higher, farms, agriculture and small towns give way to sweeping vistas and wide-open plains. At every rest stop — of which there are many — your guide, Freddy, fills your head with history, trivia, tidbits and humor about the Inca Trail. On average, the dirt trail is between 3 and 10 feet wide; and many of the most treacherous parts have some sort of wire on the side to protect you. Enjoy this added safety while it lasts. Any time the trail flanks the Urubamba, you can clearly see train tracks on the other side. Freddy jokes that PeruRail passengers are cheaters, opting for an easy hour-and-a-half train ride to Machu Picchu instead of your four-day journey by foot. At one point, your group is joined by several friendly locals walking with their donkeys. It doesn’t take long to realize that the “taxi ride” they are offering is on a donkey’s back — but determined to hike the entire trail on your own two feet, you politely decline. For just a few Peruvian Soles, you can ride this donkey or have it carry your bags. Cacti are everywhere during the first few hours of the Inca Trail. Between rest stops, friendly conversations, photo opportunities and frequent oohs and aahs, it’s a short three hours before you arrive at your first destination: the ruins of Llaqtapata. Known as the Valley of the Wind, these ancient agricultural terraces precede the Incan era and were an important rest stop and shrine on the path to Machu Picchu. Today, a small town sits at the base of the ruins. Freddy gives your group time to explore the area, which includes a climb up cliffsides to get the best view, exploring babbling brooks and imagining what life was like there hundreds of years ago. A modern-ish town sits below the Llactapata agricultural terraces. While your guidebook may call it Llactapata, the locals call it the Valley of the Clouds. Rested and stuffed after your delicious lunch, only a few more hours of hiking remain. Mountainous views and an incredible diversity of plants give you plenty to be impressed by, while the sky alternates between cloudy, foggy and cerulean blue. Fortunately, it never rains. Missing “civilization?” Although there are no more ruins to explore today, you find plenty of train tracks, giant metal towers and power lines to distract you. More than anything, you are astounded at how well your body has held up thus far. Even with the constant up and down of the trail, your legs feel better than ever. That said, you are very much looking forward to a good night’s sleep. 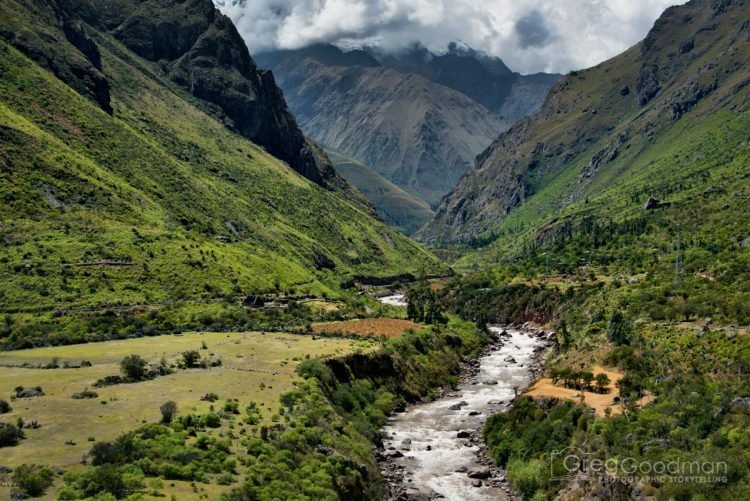 Everywhere you look, the Inca Trail is flanked by beautiful mountains. Your guide, Freddy, jokes that PeruRail passengers are cheaters: making the 4 day journey to Machu Picchu in just 1.5 hours. The clouds. Oh, the clouds! This is the view from your campsite in Wayllabamba on the first night. Completely full and energized from breakfast, you quickly pack up your bag, hand your chuskie 10 pounds of stuff and get ready to start the day’s climb. The first thing you notice is how different the terrain is from the day before. That’s because you’re now hiking through a rainforest! You also notice that the group seems to be moving more slowly than yesterday. Freddy explains that this is normal, as the higher elevation means less oxygen is entering your bloodstream. He suggests chewing coca leaves to cope; and he encourages everyone to reflect on the role that Pachamama — Mother Earth — plays throughout the trek. Without Pachamama’s solid ground beneath your footsteps, following the ancient footsteps of the Incan and Andean people would not be possible. With this in mind, Freddy requests that everyone find a special rock or stone somewhere in the rainforest and hold on to it for later. At 7am, the moon is still visible from your breakfast table. This is your general view for a good chunk of the second morning on the Inca Trail. Just try and count how many caterpillars you see on second day of the Inca Trail. Wild plants grow alongside the rainforest segment of the Inca Trail. Don’t forget to look up… the trees are amazing! Topping out at 4,215 meters — nearly 3 miles — above sea level, Dead Woman’s Pass is considered the toughest part of the Inca Trail. Many on the trek have worried about it since booking their trip. But as you tackle the steep ascent, it doesn’t seem so bad. More worrisome is the distant roar of thunder and a dense cloud covering the valley below. As you continue to climb, it seems as if the fog is following you and, periodically, drizzling a light rain on your head. Rejoice! You’ve just climbed up all of this to reach Dead Woman’s Pass. You reach the top of Dead Woman’s Pass to find yourself enveloped in a dense, rolling cloud, like something out of a Stephen King novel. It’s difficult to see the person next to you, though that doesn’t stop you from exploring the area anyway. While you’re waiting for the rest of the group to catch up, Pachamama decides she’s had enough teasing and proceeds to unleash a flurry of rain and hail. With no shelter to be found, you make the most of the experience and begin dancing and laughing in the downpour. Your pants and shoes don’t stand a chance; at least you packed a waterproof jacket. Once everyone arrives, Freddy asks the group to form a circle and hold out the special stones you collected earlier. On top of each, he places three coca leaves representing the transformational essence of your hike. Then, with a pure intention in your heart, you take the leaves and stone and add them to a nearby offering pile. This is said to bring good luck and blessings on your journey. Can you imagine what the view from atop Dead Woman’s Pass must be like on a clear day?! Don’t forget to take the obligatory photo next to the altitude sign atop Dead Woman’s Pass. After the Pachamama ceremony, all that’s left to do is begin the climb down from Dead Woman’s Pass. Soaked and at the front of the line, you find yourself feeling more connected than ever to Mother Earth and all of humanity. The misty atmosphere rejuvenates you and adds a certain romantic ambiance to the experience. Taking a moment to look back, you see a rainbow of bouncing and colorful ponchos slowly moving along the foggy path. Though you can’t see the world below, you know that hot chocolate, popcorn, dry clothes, dinner and good night’s sleep await — inspiring you to move just a little bit faster. One step at a time is the best way to get down from Dead Woman’s Pass. It’s not a mirage; it’s your campsite at Pacaymayu. Before going to bed, don’t forget to take in the spectacular night sky at 3,800 meters above sea level. Wakey wakey … it’s 7 a.m. Time for the hardest day of your trek. Just like yesterday, your morning starts with a delicious breakfast and your daily donation to a chuskies’ bag. Then, as the sun begins to peek over the mountaintops, it’s time to start going up again. A mere 45 minutes pass before you arrive at the Runkurakay ruins, though it feels like you’ve been hiking for hours. While Freddy gives a detailed history of the area, most members of your group use the opportunity to catch their breath … or to take a quick nap. You choose to wander around with your camera instead. Moving along, even the fittest members of your group are huffing and puffing by the time you reach the Qochapata lookout point. Located at 3,670 meters (12,000 feet), it’s a great place to soak up the sun, enjoy the sweeping vista and imagine cooling off in a nearby, though sadly not reachable, lake. After a nice rest, it’s time to head down … until the path takes you up again to explore more ruins. Then, lots more down until you reach an unforgettable tunnel of trees and vegetation with lunch waiting on the other side. Later in the afternoon, the group arrives at an incredible ridge overlooking an endless landscape of mountains, valleys, rivers and foliage. Alongside the view are the ancient ruins of Phuyupatamarka, which translates to Spot Above the Clouds. Housed within its interconnected buildings are a series of still-working ceremonial baths — enough to make you long for the day when you will once again enjoy a hot shower. As always, Freddy sits the group down for a discussion about the history of the area. He also suggests that everyone stretch their legs and get ready for the final segment of the day’s journey. Shortly after beginning your day’s hike, you will stop and explore the Pacaymayu ruins. This spectacular view is from Qochapata: the highest point on Day 3 of the Inca Trail. In addition to naturally-occurring tunnels, the Incas carved through solid rock to create their own. The Sayaqmarka ruins sit on a steep cliffside. Freddy jokes that this moss is nicknamed “the Cancer of the Inca Trail;” because of how quickly it grows and covers the path. I would advise against eating these berries. After a morning of hiking up and down steep hills, be sure to savor the gentle incline of the rainforest segment near Chaquiqocha. You will see so many yellow flowers along the Inca Trail… like these at Sayaqmarka. Sometimes, the Inca Trail passes over chasms and needs a bridge. Known to tour guides as The Gringo Killer, the final stretch of your day’s journey involves descending more than 2,000 steep and rocky stairs that separate you from your tent. As everyone goes at a completely different pace, there is no more guide service today, though a staff member stays behind to ensure that everyone gets down in one piece. Before the walk is over, several hikers will need assistance. More than an hour into the steep and knee-buckling descent, you find yourself at a crossroads. The most direct route takes a mere 30 minutes, but it is basically straight down. The other way is far more gentle and rewards you with a visit to the spectacular Intipata ruins. Going that way, however, you might not get home until after sunset. Despite the incredible shaking in your legs — or perhaps because of it — you opt for the long way down. Later, talking to friends at the campsite, it’s clear that you chose wisely. 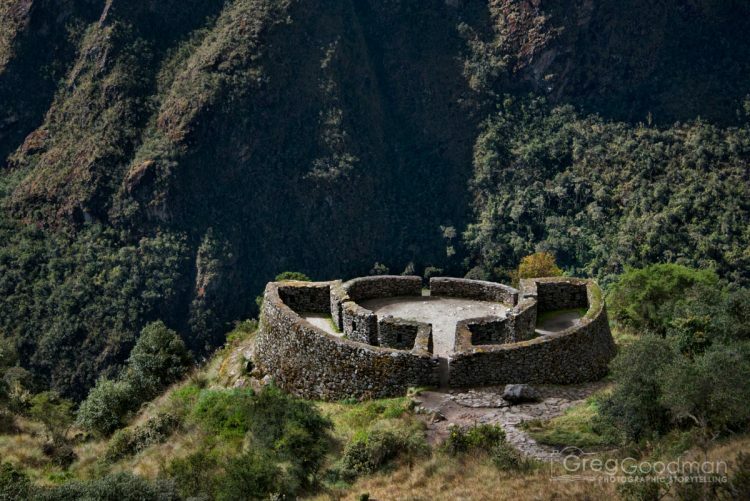 Phuyupatamarka is one of the most spectacular ruins you will see on the Inca Trail. They don’t call Phuyupatamarka “the Place Above the Clouds” for nothing. Don’t forget to look up on the way out of the Intipata Ruins. Hundreds of hikers, guides, chuskies and chefs scurry around preparing for the day. Time is of the essence: Sunrise waits for no one, and each group wants the best viewing spot at the Sun Gate. Everyone wolfs down a quick snack, dresses, packs and assembles their gear, ready to begin the hike. No one mentioned, however, that the security gate isn’t open. Instead of being in prime position, you are now stuck waiting outside along with 499 others, unsure when you will proceed. Many take the opportunity to sleep; others record video blogs, chat loudly, canoodle in a corner or take photos with a bright flash. You opt to pass the time stretching and preparing for the day. An hour later, with the sound of a river rushing in the darkness below, your group is finally on the move. An occasional raindrop falls from the trees towering over the trail and lands with a tiny splash on your face. Amazingly, most stay in an organized line throughout the trail, though a few eager beavers power-walk past you on the left. Looking back, you see a line of headlamps strung along the mountainside like Christmas lights. Few talk; everyone has the destination on their mind. Gordon, a member of your group, jokes that this looks like a bunch of coal miners going down to work in the morning. As the dark night slowly fades, lightening to a misty blue, you gaze at the clouds and wonder if you will actually be able to see Machu Picchu. Even at the Sun Gate, fog still obstructs your view. Then, as if waved away by the hand of Pachamama herself, the ocean of white gives way to the majestic sight before you. First you see the mountaintop of Hyana Picchu; moments later, the entire mountain comes into view. It’s the moment you’ve been waiting for: Machu Picchu, unveiled before you at last. As sunrise casts away night’s shadow, golden rays of light illuminate the ancient citadel. Buildings and stones are covered by a gentle yellow hue, while a florescent green aura envelops the surrounding mountains. Fog and clouds continue to swirl above, demonstrating how the ruins remained undiscovered for centuries. It’s like Machu Picchu was designed for sunrise. You alternate between taking photographs, taking it all in and jumping around like a kid who just got a new bike for your birthday. Excitement fills every fiber of your being. And it turns out that everyone had the perfect vantage point — not that anyone stayed in one place for long. The entire Sun Gate was in constant motion as hikers set up tripods, chatted with people in other groups, took selfies and shared their awe and gratitude for this amazing experience. Now, all that’s left is finishing the last 30 minutes of the Inca Trail, getting your passport stamped and finally exploring the Incan citadel of Machu Picchu. The path from the Sun Gate to Machu Picchu. Click here for a photo tour of Machu Picchu. What is the longest trek you’ve ever taken? 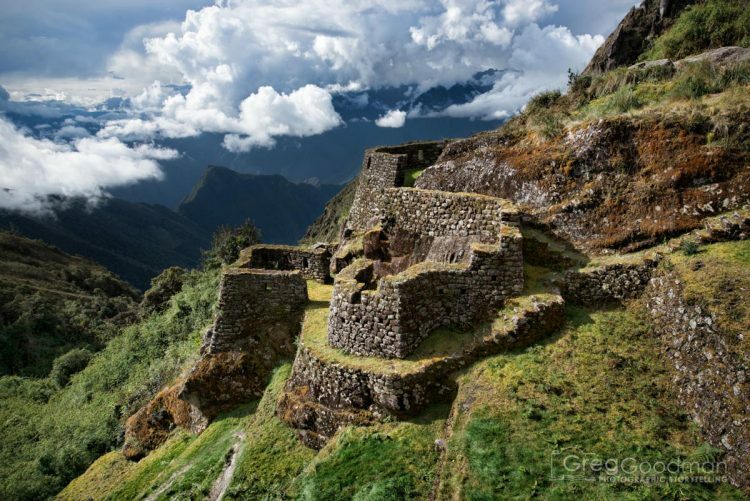 Would you hike the Inca Trail?